Those devotees, whose very existence is dedicated to the pleasure of the Lord, who have no desire except serving the Lord, for His pleasure, and who have wholeheartedly accepted the mercy of a maha bhagavat spiritual master, can see the pastimes of Lord Chaitanya even today in the streets of Sri Navadvipa dham. We do many things in life as a routine, only to realize at a certain point that what we did for years, or even decades, had a special significance. As you walk in the Temple of Lord Sri Chaitanya’s birthplace, celebrated in the three worlds as the Yogapith, you find, on the right hand side, a beautiful white deity of Srila Bhaktivinod Thakur, a now world famous 18th century saint from India. 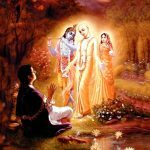 To me, it is significant that the deity is placed before one takes darshan of Lord Sri Chaitanya Mahaprabhu and His eternal associates, including the historical Neem tree. Last night, while walking out of the main gate of Yogapith, I was able to appreciate how it was Srila Bhaktivinod Thakur who uncovered this holy land and the exact place of Lord Chaitanya’s appearance in this world a few hundred years ago. The fact that mother Ganga covered Sri Mayapur dham under her sacred water, for about 100 years, after Lord Chaitanya disappeared from our ordinary vision, brings to my mind a somewhat frightening question: what if Srila Bhaktivinod Thakur did not appear in this world? Why frighten? It frightens in the sense that without knowing Sri Mayapur as it is, the meaning of human life could reduce to nil. The irony, however, is that this fact can only be realized if we know it as it is! This is exactly what Srila Bhaktivinod Thakur has helped us do. He revealed to us the glories of Sri Mayapur dham through books like Sri Navadvipa Dham Mahatmaya. Not only about Sri Mayapur, possessed of superhuman prowess, Srila Bhaktivinod Thakur wrote more than a hundred books, in different languages, with the goal of defeating unorthodox views opposed to the true teachings of Sri Chaitanya Mahaprabhu. No doubt it was the most munificent Lord Chaitanya who sent this great personality to this world. “Listen to My words. Navadvipa extends over sixteen krosas. 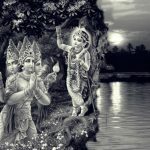 Within the sixteen krosas of Navadvipa, which are non-different from Vrindavana, there are nine islands, which form an eight-petaled lotus floating on the water. In the middle of the eight islands, or petals, lies Antardvipa. And within Antardvipa, lies the very central point, Mayapur. The eternal pastimes of Lord Chaitanya take place within Yogapith and the circle of Mayapur, the circumference of which measures three and a half miles and the diameter measures just over one mile. Because the Pancha-tattva are seated at the Yogapith, it is the most glorious of all places. Very soon, by the desire of the Lord, this will be nearly hidden under the waters of the Ganges. Then later, by the powerful desire of the Lord, the dham will again be revealed and shine effulgently. The eternal dham is never really lost but is temporarily covered, and then again it appears to our eyes. 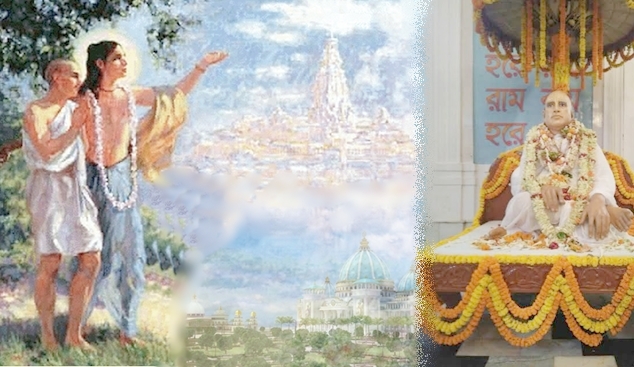 My worshipable Lord eternally resides at Mayapur, situated on the east bank of the Ganges. Although in the eyes of common people, Vishvambhar took sannyas and left Navadvipa to go elsewhere, actually My Gauranga never gives up Mayapur or Navadvipa. The devotees can perceive His daily lila. You, Jiva, will also see Gauranga dancing. This reminds me of a similar line which says- adyapiha sei lila kare gaura rai, kono kono bhagyavan dekhi bare pai- meaning the same pastimes of Lord Chaitanya are still going on and those who are fortunate enough can see them. Why not? Just like Lord Krishna’s pastimes are eternal and are still going on in Vrindavan dham, Lord Chaitanya’s pastimes are also eternally present in Sri Mayapur dham. What is difficult, however, to comprehend is, it can be seen by fortunate souls. 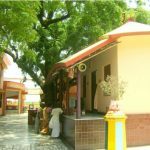 Such devotees, whose very existence is dedicated to the pleasure of the Lord, who have no desire except serving the Lord, for His pleasure, can see the pastimes of Lord Chaitanya even today in the streets of Nadia. Sounds like a hopeless situation for a person like myself but I have one hope- Lord Chaitanya is inconceivably merciful and if He wants He can manifest Himself and His transcendental pastimes before anyone. While intensely praying to Lord Gopinath, Srila Bhaktivinod Thakur sings- “ami ki doshe doshi asura sakala, pailo charana, vinoda thakilo boshi“. He is asking “O my Lord, what fault have I committed that even demons attained your lotus feet but I am stuck in this material world?” By saying this he is only glorifying the magnanimity of the Lord, which gives a hope to ordinary people like myself that by His mercy we also can visualize His pastimes and the transcendental opulence of Sri Mayapur dham one day. When they entered Jagannatha Misra’s house, the Yogapith, Lord Nityananda introduced Sri Jiva at the feet of mother Sachi as a fortunate and dear servant of Sri Caitanya. Upon hearing it, Jiva fell over like a tree uprooted by a storm. Falling at the fee of mother Sachi, he rolled on the ground out of control as he exhibited various symptoms of ecstasy. Mother Sachi mercifully blessed him, and on that very day, in that very house, they took prasada cooked by Vishnupriya devi. Lord Nityananda wept as He described this, and Jiva, and Vamsivadana Thakura, who met them there, also cried. Meanwhile Srivasa Pandita came and all four of them then left Jagannatha Mishra’s house and proceeded to Srivasa’s courtyard, two hundred meters to the north. .
As Jiva was immersed in loving memories of the Lord’s pastimes, he rolled on the ground in Srivasa’s courtyard. Then, just as he was getting up, Jiva saw Gauranga dancing wonderfully amidst His intimate associates in sankirtana. 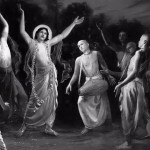 Advaita, Nityananda, Gadadhara, and Haridasa Thakura were dancing and singing. And they were joined by Shuklambhara and hundreds of others. Seeing this, Jiva became unconscious with ecstatic love. Sriman Nityananda Prabhu next took Jiva to Advaita’s house, twenty meters to the north. After rolling on the ground there, the four men went to the house of Gadadhara, just ten meters to the east. From that place, Nityananda showed Jiva the various houses of Lord Chaitanya’s associates. After seeing the houses of the brahmana community, they proceeded to the bank of the Ganges in a happy mood. “He is the guardian of Mayapur. This is where the praudha-maya energy, yoga-maya, in charge of spiritual perception) is eternally situated. When our Lord disappears, by His desire, the Ganges will swell. The Ganges water will almost cover Mayapur for a hundred years, and then the water will again recede. For some time only the place will remain, devoid of houses. Then again, by the Lord’s desire, this place will become prominent, and people will live in Mayapur as before. All these ghats on the bank of the Ganges will again be manifest, and the devotees will build temples of the Lord. Can you, the readers, imagine the inconceivably great fortune of Sri Jiva, who was hearing this prophecy that we, the residents of Earth, are able to see coming true, right in front of our eyes, at Sridham Mayapur, straight from the all-auspicious mouth of Sriman Nityananda Prabhu! I am very sure I cannot. One more thing that blows my mind off is, that same, greatly empowered Vaishnava saint, Srila Bhaktivinod Thakur, could visualize this exceedingly wonderful Temple almost a century before its foundation was finally laid by the relentless and committed disciples of A.C. Bhaktivedanta Swami Srila Prabhupada in 2009. Through his personal association and teachings, Srila Prabhupada inspired his disciples to build this adbhut mandir in Sri Mayapur. He personally guided them how the Temple should look like and how eventually it will attract the whole world to this holy land. We need to note that what Sri Jiva says here about Lord Nityananda is not out of some temporary emotions. His statements are verifiable through Vedic scriptures. Lord Nityananda is non-different from Lord Balaram, who is the source of Lord Ananta Sesha. Non-devotees cannot understand how and why there are so many incarnations and expansions of the one supreme Lord. Most of these people mix up demigods with God and come to their own conclusion about the ultimate Truth. But such speculative process helps no one. On the other hand, by the unfathomable compassion of Lord Chaitanya, those who take shelter at His lotus feet can easily appreciate His various pastimes. While hearing Nityananda Prabhu glorifying Lord Chaitanya and His eternal abode, Sri Mayapur dham, a question came to Sri Jiva’s mind. He wanted to know where Lord Shiva and his consort will go when the Ganges hides Mayapur. This is another point that bewilders many. It is described in the Vedic scriptures how the waters of garshodaka ocean rises at the time of partial cataclysm, during Lord Brahma’s night. The water rises above bhu-loka, meaning all the planets below heavenly planets, including the Earth, go under that water. How then, can places like Puri, Vrindavan and Sri Mayapur, which are situated on the Earth not get drowned? The answer is, by the inconceivable potency of the Lord anything and everything possible. If He can place billions of planets in the orbit and make them float in the space, if He can ensure that the innumerable entities can happily live on those planets that orbit around their axis with the mind-boggling speed of thousands of miles a second, and even more, and yet sleep peacefully as if they are not moving, and if He can bring down His transcendental abode on the Earth when He descends to perform His pastimes, He certainly can make sure that these abodes are lifted above the pralaya waters, or are safe despite adverse external situations. “Who can properly describe the glories of that riverbank, called Pulina? There, where the Ganges flows, is the location of the rasa dance. Only a sandy place of land is visible to the naked eye, but that place is a jewel-like eternal dham where transcendental pastimes take place. Mayapur is considered Gokula Mahavana, and Paradanga is Sattikara [presently Chattikara]. And that place, Pulina, is Vrindavana with Sri Rasa-mandala. Later, the sound of tumultuous kirtana will be heard there. There is Mayapur and Sri Pulina and in the middle flows the Ganges. O magnanimous one, you should understand that all of this is the abode of Gauranga. One who walks these five krosas of the dham will see Mayapur and Sri Pulina. 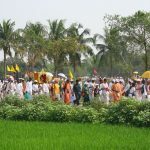 And whoever walks these five krosas with the devotees on the Phalguna Purnima day receives the eternal treasure of love of God. What makes the Navadvipa mandal mahatmaya book highly interesting and authentic is, it talks not only about the glories and history of of the places but also mentions about how these places will become invisible during a certain time and how they will remanifest before ordinary eyes in the future. And the best part is, we are able to see it coming true. That also gives us confidence that the other predictions will also come true in due course of time. Just like it is impossible for us to fully understand Lord Krishna and His abode Sri Vrindavan dham, it is not possible to fully understand Lord Chaitanya and His eternal abode, Sri Mayapur. However, by sincerely trying to follow in the footstep of the previous acharyas in association of pure, unalloyed and exemplary devotees of the Lord, we can get a glimpse into that transcendental ream. Sri Mayapur dhak ki jay!